The Alumni Association was formed by a group of local Dickinson High School graduates in 2008. 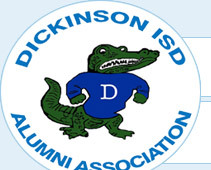 As part of the Dickinson ISD Education Foundation, we were approved by the DISD Board of Trustees in 2006. With all the various sites being used by the different classes to communicate with their classmates, one of the main purposes of this website is to be the first place all Dickinson graduates can come to and reconnect with other graduates, locate their key contact person for their class, and get current information about upcoming reunions and events. To provide activities, communications and other services for graduates and former students of Dickinson ISD and other members of the Association. To foster and support educational and related activities of the Dickinson ISD staff, teachers, and students.